The Baltimore Metropolitan Council is excited to celebrate the 22nd annual Bike to Work Day in the Baltimore region on Friday, May 17, 2019. Bike to Work Day is a national campaign that celebrates bicycling as a healthy commuting option, while promoting public awareness of its safety and environmental benefits. Bike to Work Day helps raise awareness of the rules of the road for drivers, pedestrians and cyclists, and highlights the need to improve bicycle facilities to improve safety. Hundreds of cyclists come together each spring at dozens of events around the Baltimore region to celebrate Bike to Work Day that coincides with National Bike Month. Restrooms are available at this pit stop. Big Bean Coffee shop will provide refreshments, while Pedal Pushers Bicycle Shop will provide bike tune-ups. Offering Healthy Snacks Free Rapid HIV and Hepatitis C testing in a confidential setting. All Baltimore City events are 7 to 9 a.m., except where noted. Fresh juice, samples, and swag will be offered. They will host a happy hour, complete with specials for those wearing Bike to Work Day T-shirts in the afternoon. Pit Stop Sponsor - Hord Coplan Macht, Inc. This stop will offer apples, trail mix, juice, water. This pit stop is located on Pratt Street in front of IMET Facility. Coffee, water, and breakfast treats. Stop by to learn how AIA Baltimore is advocating to make the city more bike friendly and how good design makes cities more accessible for all. MDOT MTA will be offering coffee, doughnuts, bananas, and some (limited amount of) other goodies (bike helmets, etc.). They will also be increasing the number of trains with bicycle service on B2WD, with service on even more of the Penn Line trains and some service on Brunswick. Pit Stop will take place in the Merritt Club Downtown parking lot. Coffee, breakfast snacks, swag available, as well as minor bicycle tune-ups. Bikemore will provide coffee and doughnuts to cyclists. Joe's Bike Shop will be on-site, providing raffles, coffee, doughnuts and a mechanic for bicycle tune-ups. This event will include prizes and a bike safety check from Joe's Bike Shop. In addition, there will be a convoy starting at the pit stop and going to Loyola Blakefild College Preparatory School for Boys, located at 500 Chestnut Avenue, Towson, MD 21204. The convoy coordinator is Chris Cucuzzella, and the convoy is intended for students. Pit stop building location TBA. Organized by CMS Commuter Services, Division of Safety, Wellness and Transportation (DSWT), Keeping CMS Safe, Well & On The Go! This event will include snacks for cyclists. The main event will feature Speakers and dignitaries, Bike to Work Day proclamation, on the go snacks and light refreshments, cyclists parade, vendor area, bicycle checkups, giveaways, prizes, WXCY live radio, and Team Cycle Challenge. Howard County's main event will take place at Whole Foods. There will be prizes, swag, bagels, coffee and the Holy Crepes food truck. More details to come. Join the Cycle Mill for an after-work celebration of commuting by bike. The Baltimore Metropolitan Council wish to thank our generous regional sponsors who help make Bike to Work Day possible. 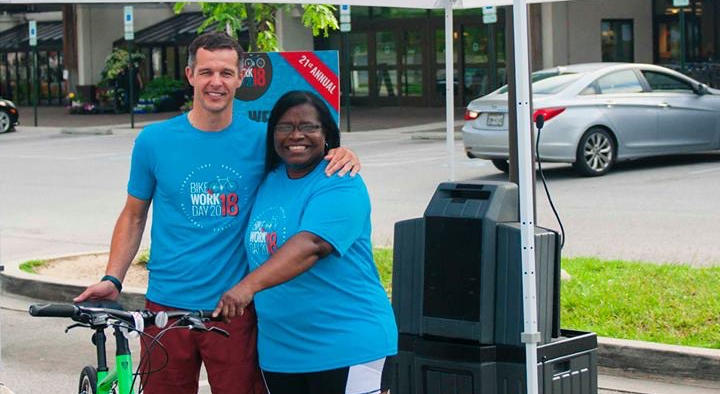 Bike to Work Day 2019 will take place on Friday, May 17. Contact us if you have questions about sponsorship or registration.